We fully intended on entering Nicaragua at Los Manos, but our entry was denied. The trouble began when we tried to cancel our Honduran vehicle permit. The woman at the Aduana refused to cancel it. She insisted I walk into Nicaragua, and return with a permit before she would process our vehicle paperwork. This is not normal procedure. But then, nothing here is ever normal. So I complied and everyone on the Nicaraguan side was quite agreeable, and shuffled me from place to place until I handed my passport to Migración. After a bit of a wait I was informed that we would not be allowed in to Nicaragua. We had neglected to apply online, 7 days in advance. Nothing we had read had indicated this was necessary. Needless to say, we were very frustrated. The Hondurans were sympathetic. The Nicaraguans adamant. We had to re-enter Honduras. Then we drove down the road to a Texaco gas station. Sitting in the van in the parking lot, using Bobs iPhone, we filled out our Nicaraguan government application, requesting to enter in 7 days time, on December 28th. So now we had another week in Honduras. 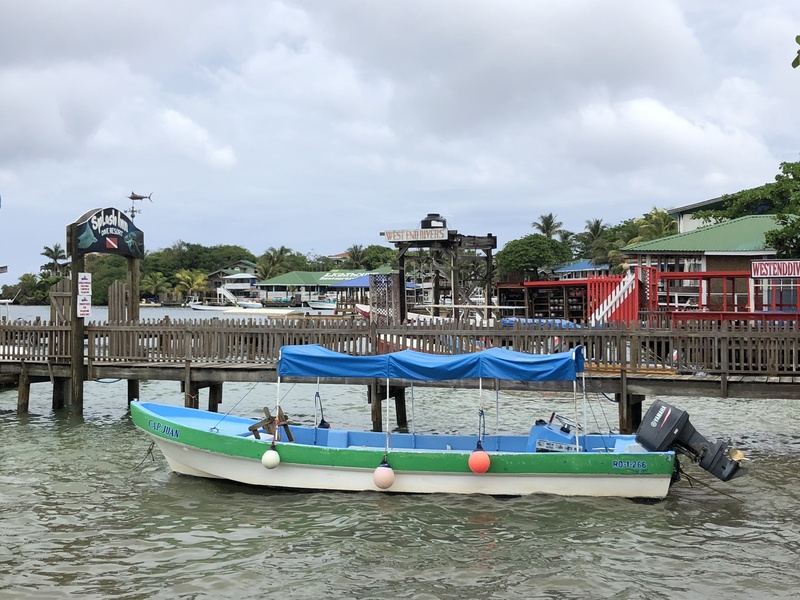 It was time enough to visit Roatan, an island in the Caribbean Sea, just off the northern coast. But the coast was a fair drive away. As luck would have it, google showed us a route eastward, taking us away from the congested main highway. We spent the rest of the day on RN 15, a smooth paved highway, camping for a quiet night near a water park and restaurant. The next day our route turned north on RN41, a wide gravel road which was not marked on our paper map, but it was clearly a nice yellow line on google map. The bad thing about google is that it doesn’t always know what it appears to know, and there were times that afternoon that I questioned our sanity. 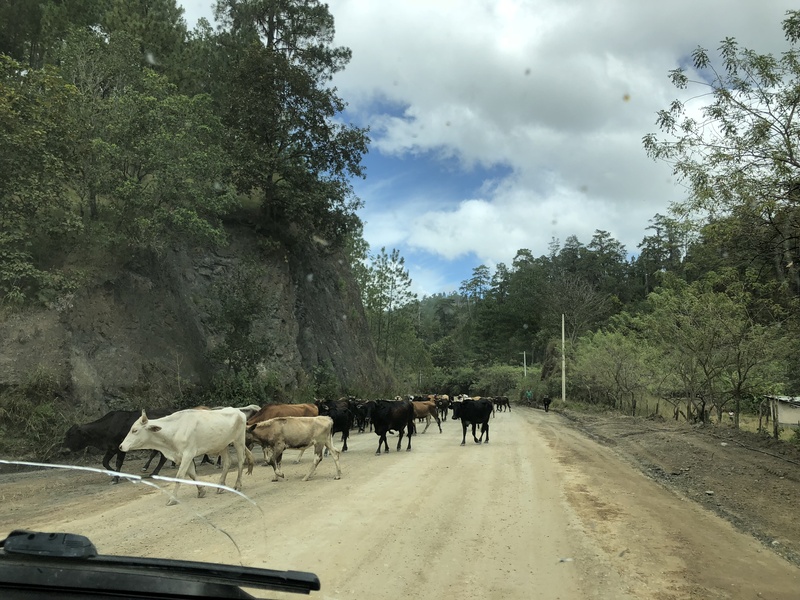 The drive was up and over mountainous terrain covered in pine forest and red rock, through small villages and passed countless farmyards. There were kids on bicycles, pigs and chickens rooting at the roadside, saddled horses parked at the tiendas, laundry hanging on the barbwire fence. There were a few trucks, most carrying people in the back box, bandanas over their mouth to keep out the dust. Average speed 60 km/hr. It was beautiful rolling country side, and we enjoyed the spectacular vistas. And then without warning, the road turned to a single rutted track. We were too far in to turn back. 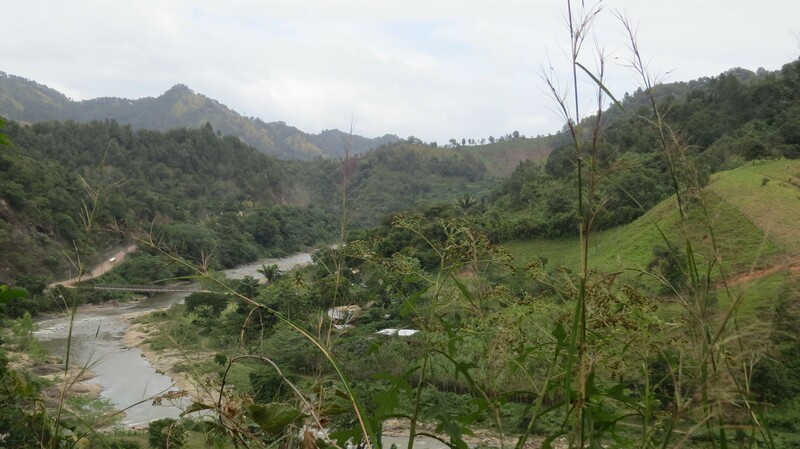 Bob coaxed the van through mud bogs and shallow creeks, crawling passed spots where half the road was washed away. There were a lot of tense moments. For awhile we followed a bus, an old school model whose driver did not care about the suspension. He flew that bus over the bumps, rocks, and ruts, and I can’t imagine the head injuries for those inside. After awhile the bus left us behind. The road went on like this for at least 2 hours, average speed 30 km/ hr. Eventually and thankfully, there was an end. We arrived at the paved highway, halfway between Olanchito and Saba, an hour away from the sea. 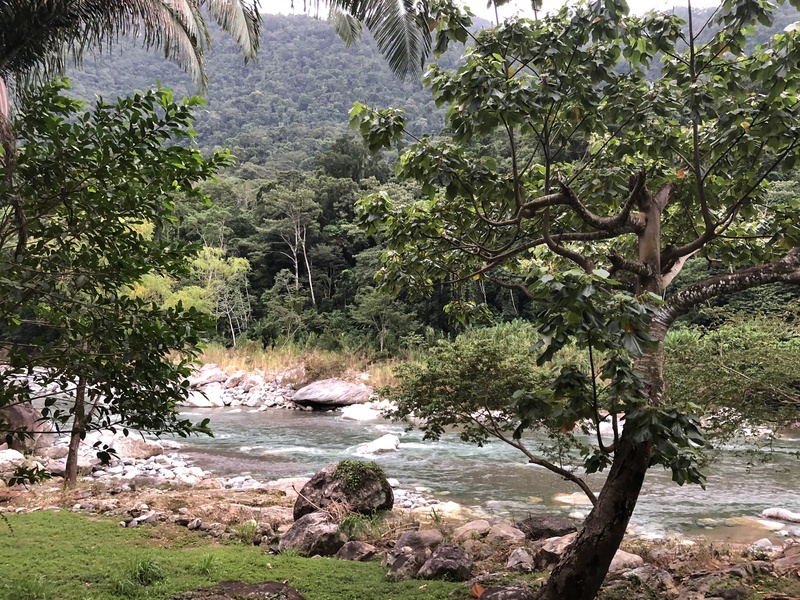 Nearing the coast, we headed toward a stretch of eco lodges tucked into the jungle. We had read that we could find camp spots there. The road was narrow and rough with barely room to pull over. Not finding the camping, we stopped to inquire at Villas Pico Benito. The manager George, a transplanted American, said that although they did not have camp spots, they did have a room available. It was a bit pricey but the view from the restaurant was gorgeous and the drive had worn us thin, so we stayed. George showed us to our room. We were amazed to have a spacious one bedroom apartment with living room, kitchen and a private screen room overlooking the rushing river. 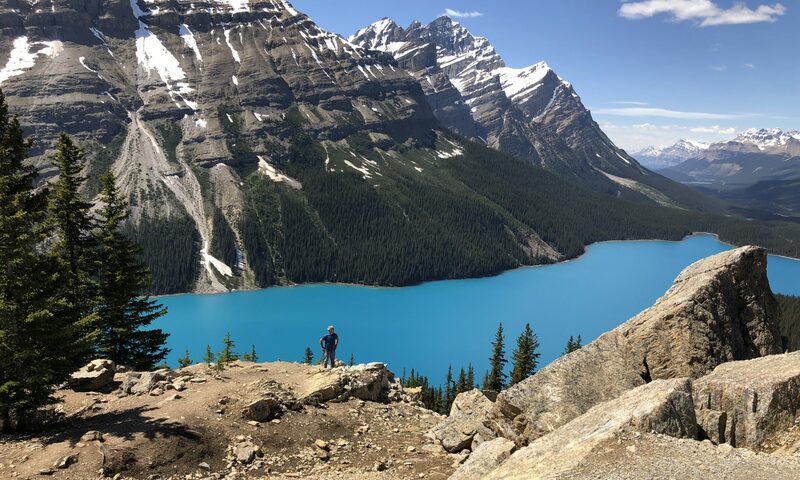 High above, water cascaded down exposed rock and disappeared into thick vegetation. 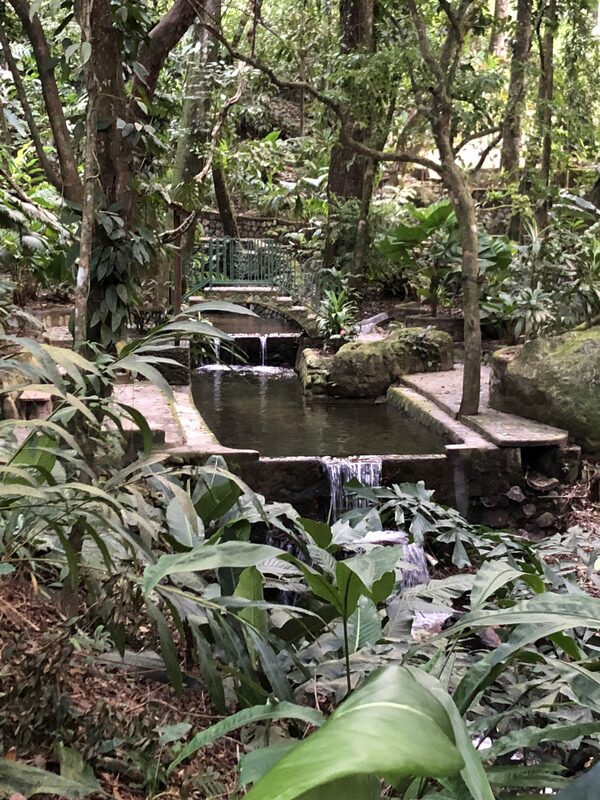 The entire lodge was woven into the jungle, with villas separated by winding stone paths, cascading pools and little rock bridges. The restaurant bar overlooked a swimming pool that spilled its contents over the edge and down into the river below. I am not making this up. After the day we had, it was heaven on steroids. At the port city of La Ceiba, we left the van in the secure parking lot, and caught the 0930 AM ferry for Roatan. We were forewarned to expect a rough ride. As the ferry pulled away from port, the crew passed out small orange vomit bags. I took one. The boat rolled and pitched, and my head was in a vice grip. With eyes closed, I listened to babies cry and people wretch. It was 60 minutes of agony. Bob was not bothered a bit, and spent the whole time playing games on his phone. 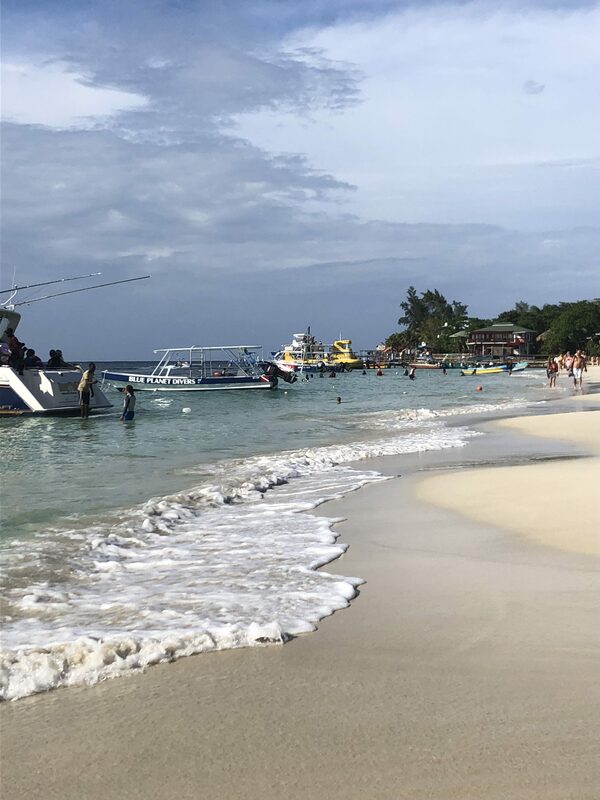 The largest of the Honduran Bay Islands, Roatan is a vacation destination for tourists from around the world. There are several popular areas on the island, but we only had time to see West End and West Bay. We stayed in West End, a strip of hotels, shops and restaurants on one side of the street and water on the other. Our hotel, Mr. Tucan, was on the second floor with a lounging terrace, and a row of stools where you could sit and look over Half Moon Bay. We liked this area for its small town feel and its mix of locals and tourists. The next day we packed our snorkel gear and caught a water taxi over to West Bay. The beach on this side is long and wide with lovely soft sand. There is a marked snorkel area at one end of the beach, where a rock wall juts out into the water and it’s resident black lizard poses for photos. The snorkelling was very good and we saw all colours and sizes of fish. There were little black ones, smaller neon blue ones, striped, blotched, rainbow colours, pinks and yellows and one skinny translucent fish with a long pointy nose. My favourite was a large navy blue fish with tiny light blue stripes. The activity on top of the water was just as interesting. This is a world class diving hotspot and diving boats went in and out all day, carrying loads of steel grey oxygen tanks and black clad divers. There was a parasailing boat pulling a wee tiny person high in the sky, pods of kayakers in orange rental boats, seadoos zipping about, water taxis, fishing boats, and a large yellow glass bottom boat that cruised back and forth on the outer edge of the snorkel area. Hawkers drifted up and down the beach, offering jewelry, coconut water, red leachie fruit, or massages. They all thought Bob needed a massage. Christmas Day was blah as far as festivities. You can’t really celebrate without family. We talked with the kids on the phone, and look forward to meeting up with them in Peru. On Boxing Day we returned to the mainland on the late ferry, and decided to stay the night in La Ceiba. We lucked into finding the Rainbow hotel, in a garden setting, owned by a friendly German woman named Barbara. The rooms all face an open air restaurant, each painted a different colour of the rainbow. We enjoyed conversation with the other guests while eating Barbara’s home cooked food. Bratwurst, red cabbage and spaetzle were a nice change from beans and plantains. We had applied to enter Nicaragua at the quieter southern crossing of Guasaule, a long drive from this northern point. Neither of us wanted to see route #41 again, opting for a more circuitous route but nonetheless, a paved road all the way. 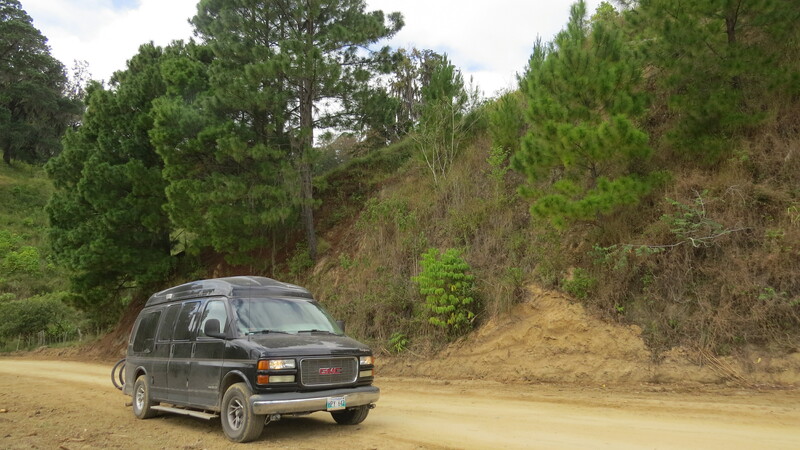 We headed west toward San Pedro del Sul, then south to the capitol city of Tegucigalpa. There we turned west onto CA-5 and had decent pavement all the way to the Pan-American CA-1. As we left La Ceiba, we passed miles of Dole pineapple fields, the tidy squares of crops divided by tractor pathways. Workers in the field were using machetes to chop the tips off the stalky leaves. 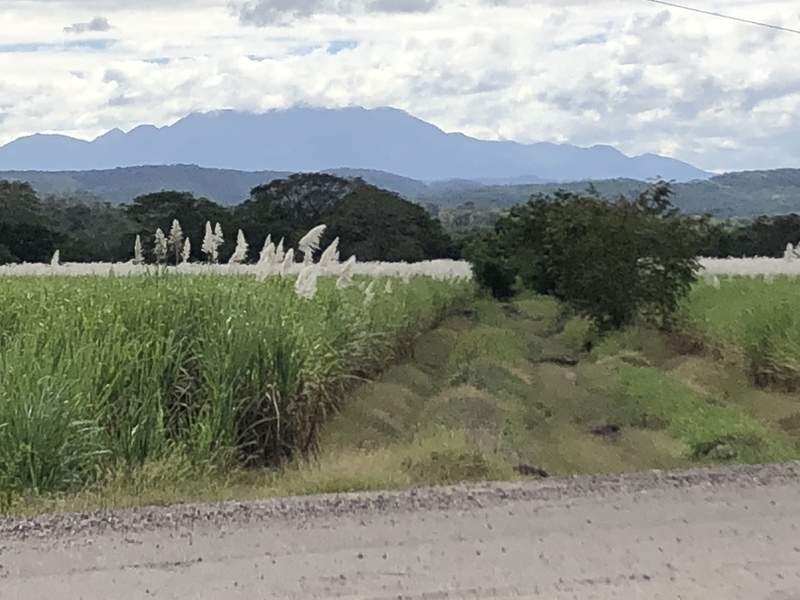 After that were large fields of sugar cane, the feathery white plumes floating in blue sky. 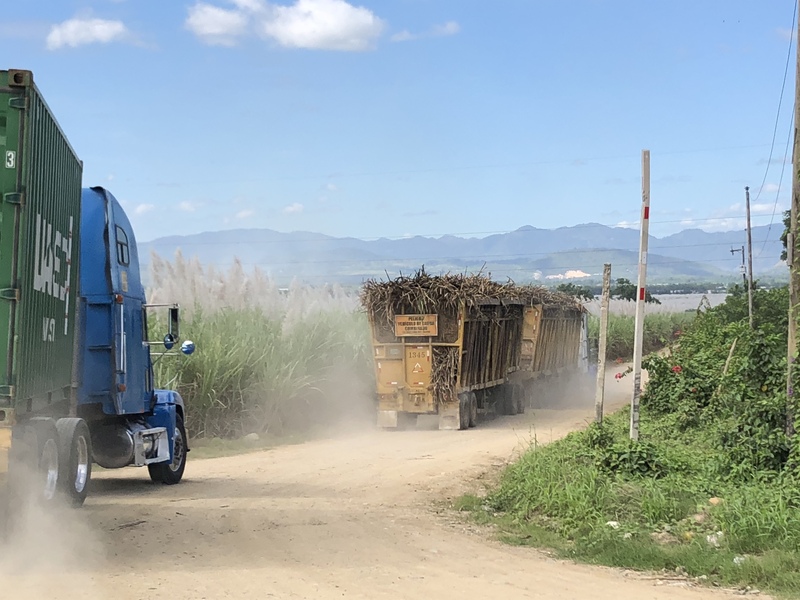 Sugar cane trucks with their huge heavy loads lumbered slowly down the road, and getting by each one was difficult. About an hour into the drive, we were motioned to pull over. A young, stern faced policeman said that there had been an infraction. Bob had passed on a curve, over a solid line. Bad Bob. To be fair, he has acquired a little Honduran blood. And it was not a blind curve. The penalty would be $30 (not painful) but we would have to return to La Ceiba to pay it (painful) and the licence would be returned after payment (very painful). This could cost us at least a day of our time. We talked and waited. After awhile the officer asked, “Does the caballero (gentleman) know he is at fault?” I said yes. Bob nodded his head. This seemed somehow satisfactory, and so after another lecture in Spanish while we nodded in agreement to words that we did not understand, he returned the liscence and said “You can go”. Whew! Forty five minutes later we almost hit a horse, missed by inches. Thankfully, the remainder of the drive was uneventful except for one accident. The semi driver lost control on the downhill and with no runaway lanes, the trailer fell over, right in the middle of the highway. Two hours from Guasaule, we pulled into the large gated parking lot of the Oasis Colonial hotel. It was blistering hot outside and we were instantly cooled by the wide breezy hallways, with arched doorways leading to interior open air courtyards. Along with several Honduran families, we had a leisurely evening at the pool, swimming, eating and listening to the very loud spanish pop music which pounded out of two huge speakers on the pool deck. After a complementary breakfast of eggs, frijoles, sweet plantains, tortillas and coffee we headed for the border. We knew the Honduran side would be easy, and declined the many offers of assistance for a small fee. A boy of about 8 years of age made big swooping arm movements, dramatically directing us into a clearly marked parking spot. He then enthusiastically conveyed that he would watch our vehicle while we were inside. We knew the van was safe where it was, but he was a charmer, so we agreed. While in line for migration, an older man began insisting that we move to another line. We were doing our best to politely ignore him until the nun standing in front of us turned and spoke in slow spanish, “There is a special line for old people”. Well, OK then. The exit process was quick and easy, and our young man was sitting right behind the van when we returned. He happily accepted the few cordobas that Bob offered. When we realized that several bicycle taxis had blocked up the exit lane, our new little friend ran around getting them moved so that we could get through. As we drove off he gave us a big smile and a thumbs up. What a cutie. To get through the Nicaraguan side, I had written down the 8 steps that are required, and ticked each one off as we went. The whole process was a curious mix of intense scrutiny combined with an easy going attitude. At one point, a young guy was running around with both our cell phones, one in each hand, trying to verify our permission to enter. He had to hold his thumbs on the screens so they would not lock up, while trying to open doors and squeeze by co-workers. He was friendly and cheerful. All together, we passed through fumigation, migration, permit investigation, two verbal question sessions with identical questions like “Are you married?”, vehicle inspection, bag scanning (our choice of which bags got scanned), and vehicle importation paperwork. The final step was purchasing mandatory insurance for the van, sold by women who were sitting on the grass behind the bank building. And that completes the approval process for Nicaragua. We were in! Yay! The Plan Spend New Years in Granada and then drive to San Juan del Sur on the coast. I look forward to the blog and usually read it twice. Ted wishes he was joining you. He is heading to Rio de Janeiro of Brazil and more of south America Feb 2. Flying out of Quito Ecuador on Feb 23. He will plan as he goes.